For many years now Ministry of Paintball has scammed UK paintball enthusiasts through their unethical ticket-selling practices, false advertising and sheer refusal to follow any guidelines in regards to the fair promotion of paintball games. Sadly today Delta Force received confirmation that the discount website Groupon (and almost 1,000 of their loyal customers) was scammed by Ministry of Paintball into purchasing some ‘discounted’ paintball vouchers. 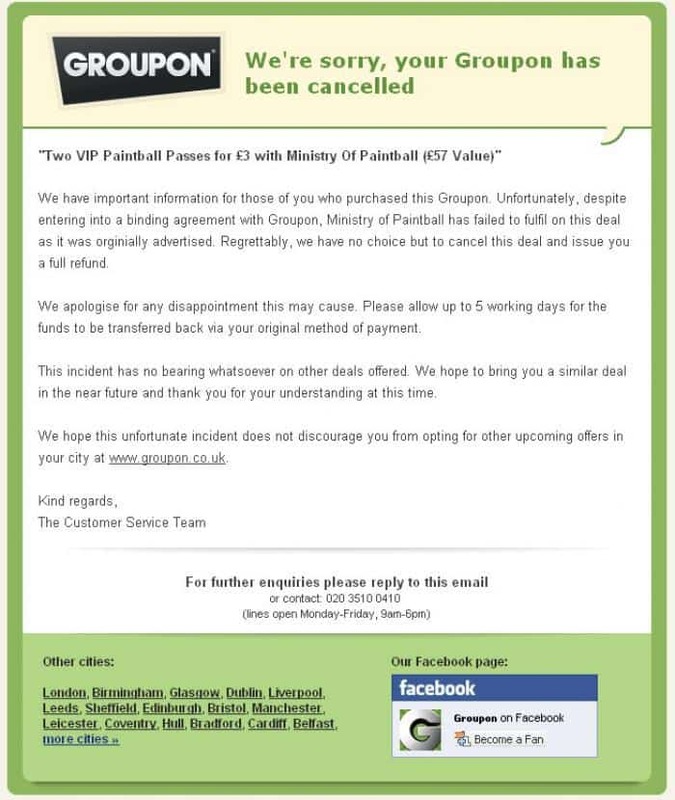 Ministry of Paintball failed to inform Groupon and all potential buyers that in order to book an event each person had to pay an additional £11.50 on top of what they had already paid for the voucher. In typical Ministry of Paintball fashion they failed to fully disclose how the deal worked, and when questioned about the £11.50 charge they claimed that it was in fact Groupon that had excluded the key term from the fine print of the deal. Yet again it appears as if Ministry of Paintball, the cowboys of the UK paintball industry, has scammed more paintball enthusiasts through their dodgy dealings and unethical practices. If you’ve been unfortunate enough to come into contact with Ministry of Paintball and were not 100% happy with the encounter then contact the UK Paintball Association for advice and assistance on how to get your money back. Alternatively, if you have Ministry of Paintball vouchers and would like to redeem them at a Delta Force centre and enjoy a day of paintball with a provider that genuinely cares about your playing experience then call us on 0844 477 5050.